Native to South America and is commonly found growing around mountain villages, hence its name. Also known as Vasconcellea pubescens. Highly ornamental as a sub-tropical planting around the courtyard where the aroma from the fruit can be appreciated. Choose an area where leaf drop is not an issue. Unripe fruits can be eaten as a vegetable but ripe fruits always contain more vitamins and minerals. 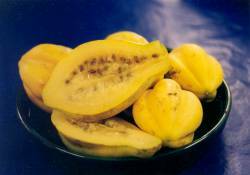 They contain vitamin A, B, C and iron. There has been talk that the leaves have cancer fighting properties. It can be eaten fresh or cooked, usually baked or boiled. You can also use as a meat tenderiser, it can be made into deserts, added to ice-cream, or to savoury dishes, such as soup or stew. 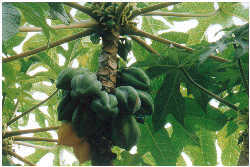 One tree may produce up to 50-60 fruits per season. While the tree is most often found naturally in shady conditions, it performs well in full sun once established. They do grow their best in humid conditions. Protect from the wind and frost while young. The tree is not particularly picky about soils and conditions but is often difficult to transplant. Will grow quite happily in poorer soils as long as they are not waterlogged. Are drought tolerant but prefers deep fertile free draining soil. Mulch well as roots are shallow. Plant 2 or more plants to ensure good pollination. Space them 3m apart. Feed with high phosphorus NPK fertiliser in spring and summer. Old trees can be rejuvenated as long as they are healthy. Cut back at an angle at 60cm and cover the cut with black plastic to prevent it from cracking. Allow for 3 shoots to develop. Mountain Paw Paw has very few problems. It is susceptible to root rots if the soil becomes too wet and cold.